Peninsula Cat Rescue is a not for profit, volunteer run organisation on the Mornington Peninsula established in July 2010. We rescue cats and kittens from pounds and shelters. Our organisation was formed by a group who have been involved in the rescue and re-homing of abandoned and unwanted cats and kittens for a number of years. Adopting a cat or kitten from Peninsula Cat Rescue helps to break the cycle and saves a life. Please contact the foster carer by phone to arrange a time that suits both of you to come and meet the cat/kitten. Raza is a dear little boy who has come along in leaps and bounds in foster care. 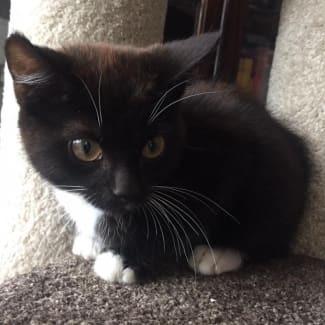 He has learnt how to be a kitten from his foster siblings and is up for snuggles with his human foster carers. Raza has big round eyes, silky soft fur and loves to play. Raza really likes other cats and is more confident when around them. He would benefit from having at least one feline companion. Raza would do better in a quieter household.